Inside HTML Executable digital publications, your websites are protected against external modifications and truncated downloads because publications check their integrity before running. Create compact ebooks without losing performance! Your website files are strongly compressed using algorithms such as LZMA, PPMD that easily beat the standard Zip deflate method. HTML Executable uses its own archive format so end users cannot unpack your ebooks with their Zip/Unzip utility or view their contents. Once your HTML pages and PDF documents have been compiled into a publication, end users will not be able to extract and reuse HTML, PDF and graphic source files; in fact IE and HTML Viewer publications do not require files to be extracted for displaying them (they directly read data from memory). This feature is obviously not available with Self-Extracting publications. Create publications with an unlimited number of files (according to computer configurations) up to 4 GB. 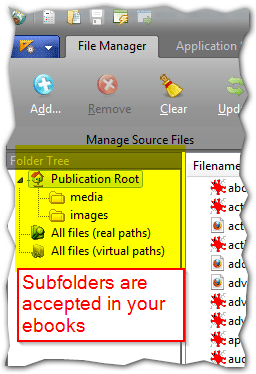 Digital publications accept long filenames and even same filenames for files if they are in different folders!